Even as parents, we might be tempted to drive differently when we have a friend in the car, so how much harder is it for our teenagers? 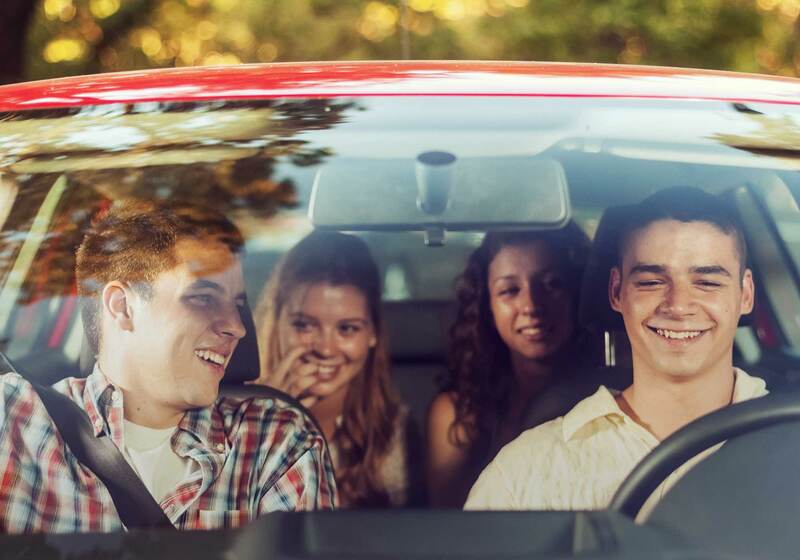 Even as parents, we might be tempted to drive differently when we have a friend in the car, so how much harder is it for our teenagers who have just started to drive and for whom their peer group is everything? Not only do passengers potentially distract the driver by chatting or turning the music up but research shows that peer pressure can actually encourage bad driving and cause drivers to show off.³ Young drivers can drive badly not because they don’t know how to drive well, but because that’s how they think their friends expect them to drive.⁴ For example, peers might encourage each other to drink and drive, check texts, speed or otherwise act recklessly behind the wheel. Unsurprisingly, there have been calls for restrictions on passengers for new drivers and, whilst the government has no current plans to introduce a graduated driver licensing programme, it is important for young drivers to be aware of the risks so they can make informed decisions. It’s important to talk to our teenagers about the dangers of accepting lifts from their friends and help them to refuse a lift from a friend who drives recklessly or has been drinking or taking drugs. Tragically, more young women die as passengers than as drivers⁶, which is why campaigns such as ‘For my girlfriend’ have been set up to encourage young drivers not to drive too fast and to keep their passengers – whether it’s their best mate, girlfriend, boyfriend, sister, brother – safe. The reason more girls die as passengers than as drivers is that they are more often travelling as the front seat passenger.⁷ When a driver loses control and is heading towards danger, for example, a tree or a brick wall, their instinctive reaction is to steer themselves away from the danger. Unfortunately, this means the front passenger seat often takes the impact of a collision, so it’s become known as the ‘Sacrificial Seat’. This is why it’s so important that we teach our teenagers that not only do they need to control their behaviour as a passenger but they must also speak up and challenge any inappropriate driving. Perhaps, as parents, we need to consider offering a mum and dad taxi service a while longer. It might be inconvenient but letting our teenagers know we’ll always pick them up if they’re stuck means we’re better safe than sorry. We can agree that if they’re ever in a situation where they don’t feel safe – as a driver or a passenger – even if it’s very late at night, they can call and we’ll pick them up, or make sure they have emergency taxi money and taxi numbers. Whether our teenagers are the drivers or the passengers it can help to be prepared. Talking to teenagers about different situations involving peer pressure and driving can help them rehearse and plan difficult scenarios in advance. And we can let teenagers know they can use us an excuse in order to save face. For example, saying “If my parents find out, I won’t be allowed to use the car,” might deter friends who’re keen on keeping their lift! It’s worthwhile reminding teenagers that, as the driver, they’ll be the ones in control. They can make the decisions about where, when, how – and who – they’re going to drive safely. The situational risks of young drivers: the influence of passengers, time of day, and day of week on accident rates, Doherty, S.T, Audrey, J.C and MacGregor, C., 1998 ; see also Carrying Passengers as a risk factor for crashes fatal to 16- and 17-year-old drivers, Chen, L.H, Baker, S.P., et al, , Jama, 2000.